Does Brexit make our ancestors turn in their graves? Would our ancestors be turning in their graves if they realised their sacrifice in two World Wars were in vein? For centuries it has been in Britain’s national interests to hold the balance of power in Europe, they fought two World Wars to hold on to that status when fractious European nations and their expansionist ideology threatened Britain’s security. Apart from the economic consequences, what the political repercussions of a Brexit from the European Union are, in the long term remain unknown but arguably, anti-western leadership must be rubbing their hands together anticipating the time British power on the continent is quashed once and for all. Obviously, it is too soon to assess the outcome, but if history is any indication, then the after-effects of Britain’s exit from Europe are not reassuring. The Registrar of Births Deaths and Marriages, Kilmore & Kilbride published his quarterly report for the period ending 31 December 1878 in the Oban Times on Saturday 4 January 1879, page 5. For the three months ending December 1878 of the thirty births, which was about average, two were illegitimate. On the other hand, marriages and deaths for the period were above average. From the twelve marriage ceremonies performed during three months, seven couples tied the knot in December. Similarly, the final death tally of thirty seven for the period was above average and took the number of deaths for the year to one hundred and two, the largest ever recorded in the district. However, the quarter was excessively cold and pulmonary complaints and whooping cough had been prevalent for some time. Naturally, this had an effect on the elderly and young, with eight of the deceased over seventy years and twelve children under five years of age. Page four of the Oban Times, 4 January 1879, reported that the weather had been “excessively cold” between Christmas and the New Year. Over the preceding week, the long frost had abated and a rapid thaw set in, consequently, by Monday most of the ice had disappeared although the hills of Mull and Morven retained their wintry covering, down to their base. The thaw stopped on Tuesday night and the New Year was welcomed in with frost and a slight snowfall. However, in the Lochalsh district, rarely had sheep farmers experienced a such a terrible winter with livestock suffering great privations caused by the deep snow and severe frost, which has lasted for over three weeks. In the low ground, the hogs cannot get at the turnips while on the hills, rushes and heather are buried from sight. As a result, farmhands were hard pressed feeding sheep and cattle with hay and straw. Before going to press, the author wrote, it was bitterly cold at Oban and every indication another snowstorm was imminent. Members of Mary McFadyen and Peter McIntyre’s family were part these statistics. During the month of November, their grandson, twelve year old Peter McIntyre the son of deceased slater, John McIntyre and his widow Margaret Buchanan, afflicted with dropsy and hectic fever passed away in his Shore Street home on the 13th. On a happier note in December, Mary and Peter’s thirty year old son, Archibald McIntyre, fisherman married twenty seven year old, domestic servant, Janet McLean. Archibald’s cousin Malcolm McFadyen from the Isle of Mull witnessed the ceremony, which took place at 25 High Street, Oban in accordance with the forms of the United Presbyterian Church. Throughout the nineteenth century, the temperance movement presumed that alcohol rather than abject poverty was the primary cause of working class degradation and crime and believed elimination of the ‘demon drink’ would resolve social problems. This moralistic high-mindedness ignored the miserable reality of working class social conditions and the right of an individual to make their own choice. When the movement failed to bring about working class abstinence, they pushed for a reduction in licensed premises. This prohibition crusade conflicted with the “laissez-faire” politics of Obans ruling middle class. If not to further their own interests, the ruling middle class sanctioned ‘maximum freedom’ in the supply and consumption of alcohol. Because of deplorable working class housing conditions, tiny cramped two roomed homes that accommodated large families, it was inevitable, the family’s social life spilled onto the streets and into public houses that provided warmth, space and comfort. Thus, the public house became an extension of the family home. Despite the temperance movements endeavours to provide alternate forms of socialisation, the working class remained hostile to change, although functions that catered for children were well attended. This hostility stemmed from the fact that the land owning aristocracy who controlled the state’s public institutions dominated most aspects of working class lives, the only autonomy the working class had control over was ‘choice’ and that autonomy did not need to be dominated by middle-class do-gooders. Similarly, Obans’ ruling middle class, councillors and magistrates savoured their autonomy. They believed in freedom of choice, irrespective of whether it was the supply of or consumption of alcohol, so long as individuals acted responsibly and played by the rules. Theoretically, the magistrates steadfast refusal to reduce the number of working class public houses arose, in part, from the fact they did not want to be told what to do, in reality, the magistrates believed regulation of public houses would create a market monopoly that exacerbated poverty and not lessen drunkenness. Instead, Oban’s magistrates relied on laws and policing to control the working class ‘drink problem’. Oban’s magistrates in conjunction with the constabulary regulated the sale and consumption of alcohol. They detested working class pubs conducted in a ‘disorderly manner’. This was the case in April 1879 when, Neil Macdougall, the proprietor of the Bridgend Tavern had his application for renewal of victualler’s licence rejected. 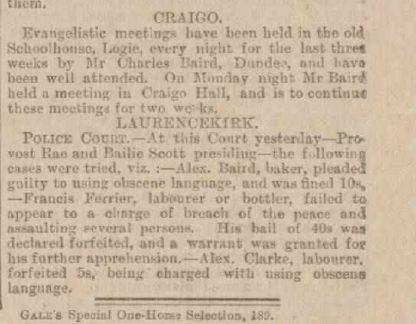 However, Macdougall’s appeal was successful once his solicitor pointed out that: during 1878, only two out of the twenty-eight cases of breach of peace documented in the police log were associated with the Bridgend Tavern. But, proprietors were powerless to control the inebriated working class after last drinks at 11pm when they spilled out onto the streets and continued their drunken squabbles in the public sphere. Arguably, John Macdougall’s threat to “spilt up the head of the town’s bellman” was fuelled by more than ale and whiskey. In April 1879, Oban town council appointed Duncan Macphail as the new town crier or bellman. Perhaps John’s father Colin, a Burgh lamplighter, had been passed over for Macphail. Amongst the working class the position of town crier would have been perceived as upward social mobility, in these circumstances, it is understandable John felt his family’s reputation had been blighted. On the other hand, the threat against Macphail and the assault of Mrs Macintyre, also known as Margaret Buchan widow of slater John Macintyre and mother of John’s only son, might be related. 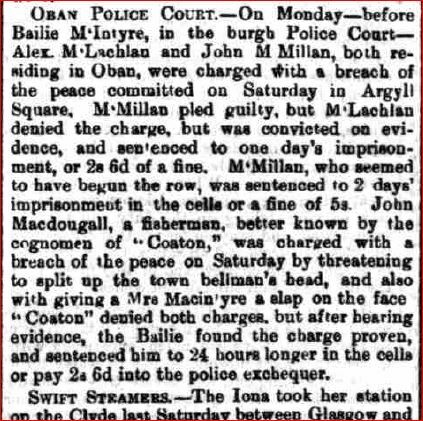 Nonetheless, Oban’s magistrates were determined to stamp out civil misdemeanours caused by alcohol and while ‘ruffians’ who provoked drunken brawls paid their dues, recidivists served a period of abstinence in Inveraray Jail. Because Oban was a small town, the magistrates understood the local habits and personalities of people who appeared before them. Consequently, justice was dispensed, which kept the ‘ruffian’s in check and victuallers in business. More importantly, individuals had the freedom to choose whether to act responsibly. In August 1861 fishermen Duncan Macphail and Colin Macdougall, elected to spend fifteen days in Inveraray Jail rather than pay £5 for contravention of the Herring Fishing Act 1860. The history of the SS Dunara Castle is as interesting as the many sites devoted to its history. For seventy odd years, weather permitting, the SS Dunara Castle brought supplies and conveyed passengers to and from the outer Islands of the West Coast of Scotland. The Old Style of celebrating New Year on 12 January is also interesting, a custom that in January 1879 seemed to be losing favour and was not observed by every village or town in Argyleshire. New Year festivities in Oban, celebrated in the New Style, were temperate which, according to the author, was usual while Oban’s publicans received a hearty commendation for the early closing of public houses – “for which act of self-denial they merit thanks”. By Wednesday the fine weather allowed people to indulge in outdoor walking for its’ own sake as well as visit friends. However, on the island of Iona, the decision to celebrate New Year in the New Style alienated the minority. On Monday 30 December, Iona residents convened to discuss New Year celebrations. Objections against the departure from a time honoured custom were raised however, it was apparent the majority were in favour of the New Style celebrations and befuddled by the minority who remained attached to old established customs. One reason, probably characteristic of Iona residents as with most people worldwide, was that the principle element conducive to Highland felicity during New Year was still on board the SS Dunara Castle. Given the weather at this time of the year, there was little doubt the SS Dunara Castle could land the liquor, essential to New Year celebrations. As it was customary not to order the New Year beverages until the end of the year, because, even in well-meaning families the best Islay whisky disappeared in hot haste, Iona residents were disadvantaged by geographic and meteorological conditions. Not all was lost. The correspondent from Iona wrote – “Our absent friends will no doubt be glad to hear that the New Year was held again on the 12th, as usual by the other half”. Written on the 17th and published the 25th January, H.A.B. of Tobermory endowed with a morally superior attitude wrote – “I am glad to find that a large proportion of the inhabitants of Iona have led the way in giving up the observance of Old Style. I hope all other islands will follow and when 1880 comes, no Highlander will be found lagging twelve days behind the rest of the kingdom”. Whether cousin John McKinnon son of Catherine McTavish and her husband, Morven born seaman, Alexander McKinnon was on board the SS Dunara Castle during Christmas-New Year 1878-79 period is unknown. What a nuisance from a research point of view that … If the vessel is trading exclusively between Scottish Ports, the law does not require the Master to keep an Official Log. The 1881 Scottish Census enumerated on 3 April, for the SS Dunara Castle docked at Tarbert, Harris, recorded John age 25 and born Oban as the Ship’s Cook. The crew of the SS Dunara Castle were lucky, reports of wrecks and drownings during the stormy season were usual. Stornoway: Communication with Harris again interrupted; heavy fall on mainland; Ondine did not arrive Friday. Mull: Salen – Severe storm from the south-east with keen frost, not experienced for several years; “Clansman” from the north unable to call at pier last Tuesday. Islay: Lloyd’s telegram stated the schooner Witton of Stralsund, Germany, F H Boortman, Master bound from Lorne to Liverpool in ballast was wrecked on the Stremnist, near Mull of Oa, Islay at about 10pm on the 7th inst. The master, his wife and the ship’s cook, Fritz Garbash drowned while four people were saved. Islay: The accidental drowning of Lachlan Kennedy who fell overboard the Nations of Glasgow occurred on the 4 January off the Mull of Oa. The Master, John Kennedy of Bowmore (father) and his brother were unable to render assistance. A report from Ardrishaig revealed the Crinan Canal was frozen and shipping could not get through. The Struggler lied panting at Auchindarroch while the Plover was icebound at Miller’s bridge. MARITIME MONDAY – Alas! No More! Robert McTavish born 23 September 1859 at Oban, the fifth child, second son of fisherman Duncan McTavish and first child of Elizabeth McFadyen, the daughter of a fisherman left a scant paper trail during his brief life. Upon completion of his schooling, probably around fourteen years of age, Robert found employment on the fishing or cargo vessels operating out of Oban as the following article from the Oban Times published 28 June 1879 disclosed, in a not too favourable light. JP Court – Yesterday, John McFadyen and Robert McTavish hands on board the smack “Isabella” of Oban appeared before A Brown Esq. and Bailie Menzies charged with stealing several gallons of porter from a cask while on the voyage from Oban to Kinlochspelve, Mull. Without sufficient evidence to prove the charge, the matter was dismissed. Probably, Robert and his uncle, John McFadyen worked for the Cumstie family, merchants in Oban and owner of the smack Isabella, who ran cargo between the mainland and the Islands. After residing in High Street, thirty odd years and wondering what prompted the McTavish family’s move to Shore Street in 1881, an article in the Oban Times, 25 October 1879 explained – “There are a number of buildings in town in course of erection or nearly finished. High Street will soon be rebuilt and when the old houses have disappeared it will be one of the best streets in the town”. It is highly unlikely the Shore Street residence was spacious enough for all eleven members of the McTavish family. Enumerated in the 1881 Census was, Duncan aged sixty a retired fisherman with his wife, forty one year old Elizabeth; thirty-two year old son, Alexander a fisherman, eighteen year old daughter Elizabeth, a domestic servant while Duncan aged fourteen ran errands for a local baker. At the time, twenty one year old mariner, Robert was unemployed while Duncan and Elizabeth’s daughters Mary eight and Catherine five attended school as did eight year old grandson Duncan McTavish. Still at home were four year old pre-schooler Flora and baby Donald. The next Statutory Record located for Robert was an entry in the Return of Deaths at Sea dated 22 February 1886. On the 25 December 1885, Abel Seaman Robert McTavish 26 of Oban drowned abroad the Aigel official ship no. 86720 as did 21 year old Hugh Kennedy a cook and engineer’s steward of Glasgow. Whether the drownings were the result of two separate incidents or one dived in to the save other is unknown. Annoyed at the lack of detail on Robert’s death certificate I exhausted my amateur detective skills to discover exactly where Robert’s death occurred. After a lot of searching, the ship’s name had been incorrectly transcribed. Using www.crewlist.org.uk a database set up to improve access to the records of merchant seafarers on registered British ships for the years 1861 to 1913, I restricted my search to the ship’s official number, getting a hit for the S.S. Nigel later renamed Juno. The company also produced smaller screw steamers and in October 1882 delivered the SS Nigel to George Hood & Co., Shipping Agents of Glasgow who operated tramp services from Liverpool to various Ports throughout the Mediterranean as well as America and Calcutta. Still none the wiser because Robert could have worked on any of these routes, further searches took me to http://www.mariners-list.com/. In 1886, George Hood & Co. sold, together with three other steamers, the SS Nigel to newly formed company, Maclay & McIntyre of Glasgow. Known as the Glasgow United Shipping Company, by 1896 the company owned thirty three ships and concentrated on the coal trade to Algoa Bay on the South African east coast, 425 miles east of the Cape of Good Hope as well as the ore trade in the Mediterranean. 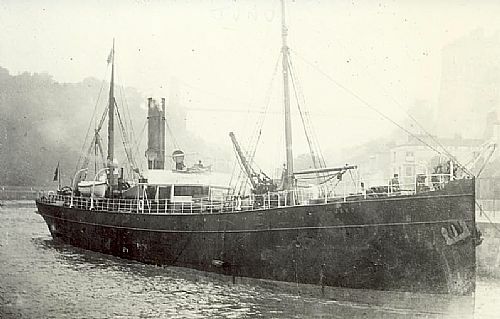 In 1890, the Bristol Steam Navigation Company purchased the SS Nigel and in 1901 renamed it Juno. A search of the National Archives (UK) described it as a continental trader. On 2 May 1917, the SS Juno was fatally torpedoed in the ballast by a U-Boat 17 miles East by South of Cape Barfleur, Rouen for Cardiff. While the question of where Robert’s death occurred has not been resolved, it was certainly an interesting exercise in locating maritime information. Mark Howard’s paper “Robert Steele & Company: Shipbuilders of Glasgow” provides a history of the company from its humble beginnings in the 1700s through the period of growth and expansion until its liquidation in 1883 – an excellent read. http://www.cnrs-scrn.org/northern_mariner/vol02/tnm_2_3_17-29.pdf‎. http://www.clydesite.co.uk/clydebuilt/viewship.asp?id=17379. Previous update by Stuart Cameron; Photo supplied by Internet source as JUNO; Additional data by Bruce Biddulph; Last updated by George Robinson from the original records by Stuart Cameron. Copyright http://www.clydesite.co.uk (except where otherwise stated). Page 1043 in the 1882-83 Glasgow Post Office Directory. Other steamers sold to Maclay & McIntyre of Glasgow: Ivanhoe GT 942; Nigel GT 1384; Peveril GT 731 and Rowena GT 1353. 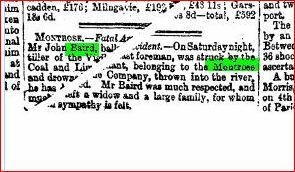 Recently I found newspaper articles relating to the death of my husband’s second great grandfather John Baird, sadly the graphic detail more revealing than his death certificate and precognition. On Saturday night, between six and seven o’clock, a most melancholy affair occurred, by which Mr John Baird, lighter master, was drowned. The lighter had been moored alongside the schooner Vigilant and after that vessel had been ballasted, she was in the act of being towed down to the dockgates, Mr Baird alone remaining on board. When nearing the gates it is supposed that she had given a lurch, and that the tiller had struck Mr Baird and thus swept him overboard into the seething ebb tide which was then approaching full force. One agonising cry was heard from the unfortunate man, but no help was available and in a moment he disappeared and was lost. The last paragraph reveals much about John’s person. “Mr Baird was well known throughout the town as an active, intelligent and obliging man and he has been cut off with appalling suddenness in the prime of his manhood, his age being only forty-two, leaving a widow and seven of a family to lament the loss of a good husband and a kind father”. Brother Charles registered John’s death on the 1st February and twenty days later Procurator Fiscal Robert Whyte handed down his findings: “About 6 o’clock on the evening of Saturday 29th January 1876 in the River Southesk and at or – thereof near the Net Dock, Montrose – Drowning”. A Body Found – On Thursday morning a woman belonging to Ferryden discovered a body at Marywells, about a quarter of a mile south of Montrose Ness. It was in a sadly mutilated condition, and was at first supposed to be the remains of Mr John Baird who was drowned off the ballast lighter six weeks ago, but that unfortunate man’s relatives failed to identify the body as that of their friend. John, baptised 2nd May 1830 son of Alexander Baird, Blacksmith, Mains of Murthill, Tannadice and Ann Clark married at Montrose, June 1851, sixteen year old Midlothian native Mary Marquis the youngest daughter of John Marquis and his wife Mary Knight. Loving the very readable handwriting. The 1860s was a particularly morbid time for the family; ten year old Alexander died from typhoid fever in July 1864 and on 30th December, Mary gave birth to a son, naming him Alexander. In May1866, John registered the death and probably organised the funeral of Mary’s brother Alexander Marquis, the cause Bright’s disease of the kidneys. At the end of the decade, scarlet fever shrouded the household. A week after her sixth birthday, Elizabeth contracted the illness, languishing four days before succumbing in early February 1869. Within a month, two year old Ann Clark named after her grandmother and twelve year old John fell to the clutches of the deadly childhood illness, John registering their deaths on the 13th March. Unlike other widows who through economic necessity remarried, Mary stayed faithful to the memory of John, the couple just a few months short of celebrating their silver wedding anniversary before the tragedy. The thought she may have received a small income from Hugh Baird’s Trust Disposition and Settlement has crossed my mind. In later census years, 1891 was the only time Mary listed an occupation, that of housekeeper. Still residing at home were married daughter thirty-seven year old flax mill worker Euphemia minus her husband and son; youngest daughter also a flax mill worker, Mary age 27 and eighteen year old baker, Robert Johnston Baird. Seventy-five year old Mary Campbell Baird residing 46 Murray Street, Montrose, widow of John Baird, Shore Labourer/Ballastman died at 4h 10m pm on the 7th March 1910 from the effects of bronchitis, son Alexander of Chapel St, Inverness at her bedside. Mary born 10 August 1834 was the last of her generation (Marquis) to pass away. Notes: Wikipedia “A lighter is a type of flat-bottomed barge used to transfer goods and passengers to and from moored ships. Lighters were traditionally unpowered and were moved and steered using long oars called “sweeps” and the motive power of water currents. They were operated by highly skilled workers called lightermen”. A search of http://www.deceasedonline.com between the years 1876 and 1880 returned a burial record at Montrose Old Cemeteries, Angus dated 14 February 1878 for John Baird – unviewed. 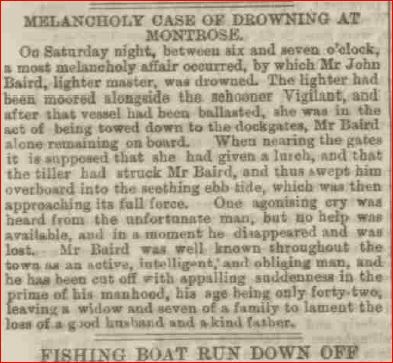 The Glasgow Herald also reported on the tragedy, the Montrose Coal & Lime Company owner of the Vigilant. Ann McTavish first cousin, three times removed, the daughter of Archibald McTavish and Catherine McLean married at Oban on the 14 May 1863 fisherman Dugald McKenzie, Minister Charles Whyte of the Independent Church officiated. I believe Dugald’s family have ties to the Parish of Kilmore & Kilbride dating back to the 1790’s, the estimated birth year of his father, possibly even longer. Donald McKenzie and Dugald’s mother, Margaret Whyte married 1813 at Oban. Whether there is a connection to Charles Whyte the Minister is indeterminable Margaret’s death occurring sometime between the 1851 census and before 1855, the beginning of civil registration in Scotland. Ann first married in 1857 to David Miller a Tailor and Bugler in the Argyll & Bute Rifles. During the Crimean War, Oban was the headquarters for the Rifles “called out under the Marquis of Breadalbane by royal warrant. In 1861 the regiment changed to an artillery force; and in 1863, when the Duke of Argyll became lord-lieutenant of the county, despite a petition by the Oban magistrates, its headquarters relocated to Campbelltown”. (http://www.scottish-places.info/towns/townhistory552.html). On census night 1861 the couple with daughter Margaret were enumerated at the Militia Barracks, Oban. This article found on the British Newspaper Archive gives a little insight into Dugald’s personality. I haven’t decided whether he was a very stubborn man or oppositional. An ejectment case of much public interest was heard before the Burgh Court of Oban this week – Bailies McIntyre and Menzies on the bench. The case excited more than usual interest – it being the first civil case tried before the Burgh Magistrates. 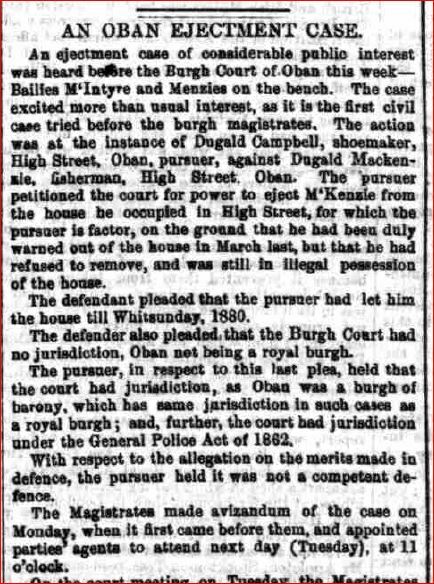 The action brought by Dugald Campbell, Shoemaker of High Street, Oban pursuer against Dugald MacKenzie, Fisherman also of High Street, Oban. The pursuer petitioned the Court for power to eject McKenzie from the home he occupied in High Street for which Campbell is the factor on the ground that he had been duly warned out of the house in March last but that he had refused to remove and was still in illegal possession of the house. the Burgh Court had no jurisdiction, Oban not being a royal burgh. the allegation on the merits made in defence was not a competent defence. The Magistrates made avizandum of the case on Monday, when it first came before them and appointed the parties agents to attend next day (Tuesday) at 11 o’clock. Mr MacArthur for Campbell; Mr Wilson of Nicol & Wilson for McKenzie and Mr Lawrence, Town Clerk as assessor to the Court. Tuesday: The Magistrates repelled the objection as to jurisdiction and McKenzie having offered to verify his defence on its merits, the case went to proof, the first witness being the Defendant. Dugald McKenzie testified to having a conversation last March about taking the house for another year at an advanced rent. 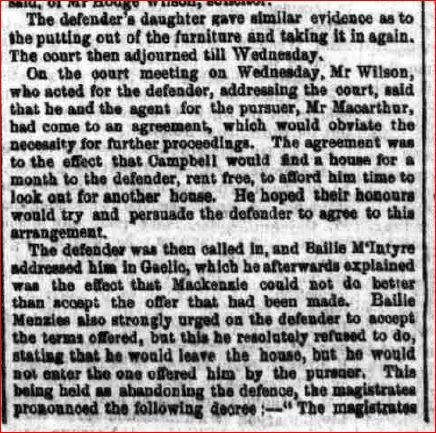 Campbell replied that he had received a higher offer for the property and following a conversation to this effect, McKenzie was warned out of the house, although he (Dugald) understood that he had taken the house for another year, from what passed between the parties. 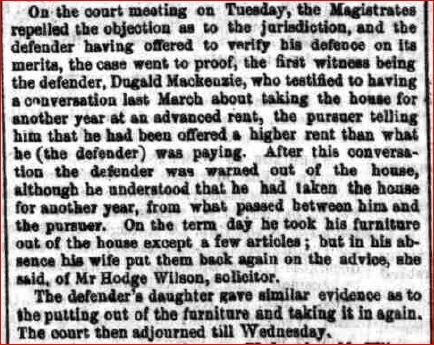 On the term day Dugald took his furniture out of the house but in his absence his wife put it back again on the advice of Mr Hodge Wilson, solicitor. The Defendant’s daughter gave similar evidence as to the putting out and taking in of the furniture. The Court adjourned until Wednesday. Wednesday: Mr Wilson acting for the Defendant addressed the court saying that he and the agent for the pursuer, Mr MacArthur had agreed – Campbell would find a house for the Defendant for a month rent free allowing him time to look for another house. He hoped their Honours would try to persuade McKenzie to agree to this arrangement. Bailie McIntyre addressing Dugald in Gaelic explained that he could not do better than accept the offer. Bailie Menzies also urged acceptance of the offer. “The Magistrates grant warrant, after a charge of 48 hours to officers of court to summarily eject Dugald McKenzie, his wife, bairns and others, his dependents (print blurry) from the premises mentioned in the petition and find the said Dugald McKenzie liable to the petitioners in the modified sum of £1 sterling of expenses and decerns”. The 1881 census has the family living at 2 Burnside Street. A few months earlier Ann had given birth to son John. Sadly he passed away in July 1884, his death certificate revealing the cause of death unknown, no medical attendant and a new address of 2 Soldiers Park, Oban. Undiscoverable in Ancestry’s 1891 census transcriptions, it is possible Dugald is deceased and Ann and children are lodging with relatives or friends. Twenty-three year old son Dugald’s 1895 death certificate gives his residence as 7 Hill Street. This time there was a medical attendant, the cause of death certified as phthisis and pneumonia for three days, friend and cousin Donald McTavish of 15 High Street the informant. Dugald Sr. noted as deceased. And Hill Street is where I found Ann a year into the 20th century employed as a washerwoman with twenty-two year old daughter Ann and granddaughter, Dolina Miller child of Ann’s first born, Margaret Miller. Ann died in 1914 age 74 at 8 Tweeddale Street, Oban. I feel she had a hard life. Charles Baird son of Charles Baird and Elizabeth Knowles spent a good part of his life helping people with their spiritual well-being. Born 25 February 1865 in Montrose at the age of 16 Charles worked as a stonebreaker with his father, a road surface-man. On census night 1891 Charles residing in 17 North Wellington St, Dundee with his mother and siblings was described as “Evangelist”. Charles Sr remained in Montrose at Little Nursery. Evangelistic meetings held in the old Schoolhouse, Logie every night for the last three weeks by Mr Charles Baird, Dundee have been well attended. On Monday night Mr Baird held a meeting in Craigo Hall and is to continue these meetings for two weeks. And at Laurencekirk Charles’ cousin Alexander Baird, baker paid a fine of 10 shillings for obscene language. In April 1895 Charles age thirty, took the opportunity to marry eighteen year old Mary Mather Crockett daughter of retired Sergeant, Alexander Crockett and Euphemia Neilson (deceased). Minister John McPherson of the Hilltown Free Church, Dundee officiated. Examining the marriage certificates of Charles’ sisters reveals the diverse religious faith each wed under – Elizabeth Milne Baird in the Established Church – 1882; Jane according to the Wesleyan Methodist faith in 1897; Williamina 1905 and Mary 1906 both under the auspices of the Baptist Church. In the Free Church on 31st December 1898 brother, David Beattie Baird married his first wife. By 1897 Charles and Mary resided in Inveraray where both their children were born: Ruth according to Ancestry’s 1901 census in 1897, the year her grandfather Alexander Crockett passed away and Charles Alexander, 25th October 1898 in Main Street, Inveraray. On Charles Jr.’s birth certificate Charles Sr. gave his occupation as tailor. In 1907 Charles was back in the Dundee area: The Courier, Saturday 29th June advertising the closing service for the Special Summer Mission held at Midmill on Sunday. Unable to find much on the web about the everyday life of an Evangelist, specifically income and housing needs when viewing the 1911 census for this couple they were enumerated as lodgers at the home of David Ogg in North Queenferry, Inverkeithing, Dunfermline. Charles 46 gave his occupation as travelling missionary working on his own account. In answering the “particulars as to marriage” question Mary 34 stated she had been married for sixteen years, three children had been born alive with one still living. Charles Jr attended school. Surely the life of an itinerant missionary’s wife would not have been easy, Mary foregoing materialistic comforts her peers of that period enjoyed or took for granted. An article appeared in The Evening Telegraph & Post, Thursday 10 August 1911 page 3 concerning the inquest into the death of Lawrence Atkinson an engineer on board a tug connected with the Rosyth Naval Base. Atkinson fell overboard at Charlestown Harbour on the 17th July and died six days later in Dunfermline Hospital. Giving evidence, Charles Baird, evangelist, Cowdenbeath said he was taking a walk with a friend when Atkinson passed and he appeared to him to be under the influence of liquor. Witness remarked to his friend that that was how so many men went missing, going down to the harbour late, missing their footing and falling into the water. Charles Baird 68, Missionary died on 23 April 1933 at 21 Backmarch Road, Rosyth, Dunfermline. His death notice described him as Rev. Charles Baird late of the United Free Church, Tomatin. Possibly for his life-long commitment to God, the Church made him Honorary Reverend in the same way his nephew received the Decree of Doctor of Divinity in September 1937. “Rev. Alexander MacDonald, M.A., B.D. minister of the parish of Dunino since 1911 and formerly assistant to the professor of Hebrew in St Mary’s College and warden of the Church’s Pastoral Institute in St Andrews”. Mary Mather Baird 75, widow of Charles Baird, Minister of Religion was found asleep in bed at 9.30 am on 8th September 1951, the cause chronic myocarditis. The informant gave his qualification as Grand Master. 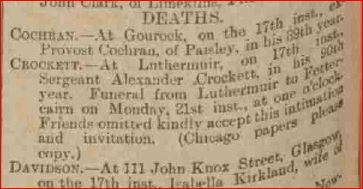 Adding to an already picture heavy post – Mary’s father Alexander Crockett was in his 90th year when he passed away on the 17th June 1897 at Luthermuir. Chicago papers were asked to copy. NOW THAT’S what you call a late in life baby – Mary born 1877. Not much has changed in the last two centuries when comparing the weekend ritual of young people today and those of our ancestors. 19th century newspaper reports of drunken brawls are not dissimilar from today’s articles. 9 April 1879 – Rowydism in Oban – Last Saturday was pay day for the navvies working on the Oban end of the railway line and in the course of the afternoon and evening there was a good deal of noise in the town but very little disorder or breach of the peace. If the navvies were pretty quiet, the same cannot be said of some young men belonging to the town, who on various occasions, notably Saturday last, behaved in a most outrageous manner. Publishing their names may have a salutary effect. Two ancestors can be described as “rowdy young men who behave in an outrageous manner”, their local watering hole, the Bridgend Tavern. Neil MacDougall, licensee of the Bridgend Tavern appeared before Bailies Menzies and MacIntyre in early April 1879 seeking renewal of the tavern’s licence. Acting Fiscal, Sgt Campbell, objected on the grounds that the tavern was a disorderly one and that no less than 28 police cases had occurred in the house during the last year. MacDougall also had one conviction for breach of certificate. Adjourned until the following Tuesday. 26 April: Mr Macgregor, solicitor appeared for Neil MacDougall, Bridgend Tavern. In relation to the charge made previously by Sgt Campbell that there had been 28 police cases during the last year, he [MacGregor] had been unable to discover more than two cases in the Fiscal’s books and statements of this kind should not be made without foundation. The licence was renewed on the distinct understanding that the house should be regularly conducted and no loose characters be admitted. John McDougall, first cousin 3xr, fisherman and brawler with a taste for alcohol. Mrs MacIntyre is likely to be Margaret Buchan widow of slater, John McIntyre, son of Peter McIntyre and Mary McFadyen (3xgreat aunt) and the mother of John McDougall’s only child. 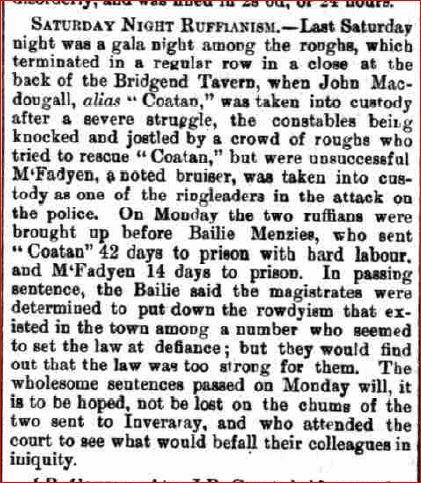 Having found several convictions for John and second great uncle Charles McFadyen on the Inveraray Jail website, this article in the Oban Times on Saturday 1st November, 1879 confirmed my suspicion both were involved in the same skirmish in late October. Saturday night – the boys get together down at the Bridgend Tavern drink copious amounts of alcohol, argument breaks out and it’s all on. The local constabulary arrive and manage to restrain John. His mates, as mates do, led by Charles, a noted “bruiser” rush to free him. Eventually police overpower the drunken brawlers and cart John and Charles off to the lock-up. The “wholesome” sentences handed down by Bailie Menzies the following Monday – Charles 14 days and John 42 days with hard labour at Inveraray. A deterrent to John! – Well, he was back again in March 1880 when Bailie McColl sent him down for 30 days and Charles, that appears to be his last visit to Inveraray. Just a pity one year (1879) of the Oban Times is digitised on britishnewspaperarchive.co.uk – heaven knows what else I would find.